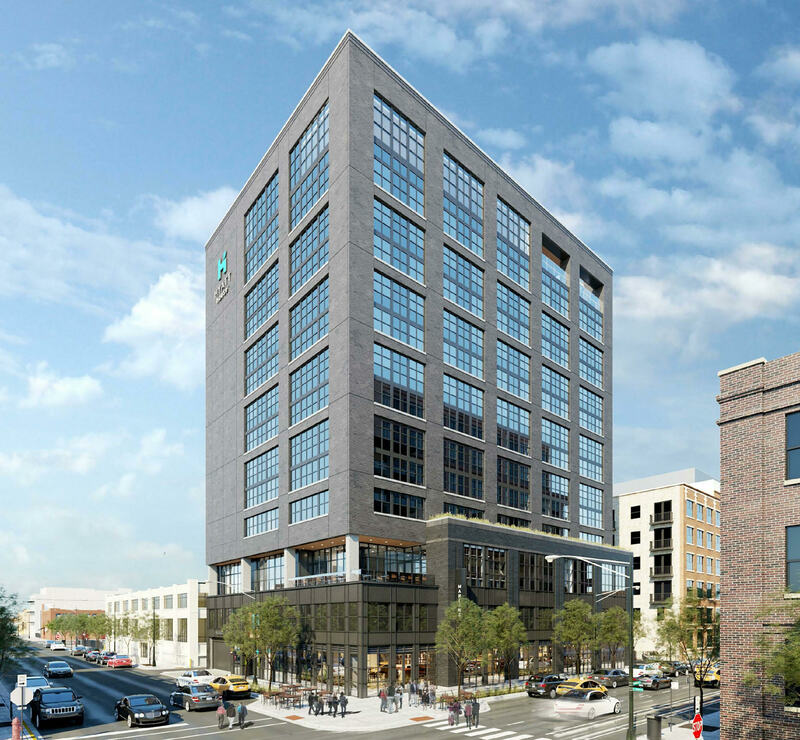 Skender, serving as base building and interior construction manager, has broken ground on Chicago’s newest Hyatt House extended-stay hotel. The new 14-story, 167,000-square-foot hotel is located in the heart of Chicago’s Fulton Market neighborhood at 105 N. May Street. The Hyatt House will be the first hotel in the Fulton Market district to cater to extended-stay corporate travelers, and includes amenities ranging from an indoor pool and multiple green roof features to upgraded common areas such as the bar and lounge with city views. Scheduled to open in summer 2019, the hotel building will offer a first-floor lobby and future retail space. The pool, workout center and lounge are situated on the 14th floor, with 200 guest rooms on floors 4-13. Sterling Bay is the hotel’s developer and Skender is collaborating with project architect Eckenhoff Saunders Architects. The hotel’s exterior cladding comprises hand-laid masonry, precast concrete panels, unitized window wall systems, metal panels and intricate storefront system. Building information modeling (BIM) is being used to coordinate all site utility, mechanical, electrical, plumbing and fire protection systems around the post tension and reinforced concrete structure. Additionally, in line with their commitment to Lean construction principles, Skender included Target Value Design in their pre-construction services to eliminate inefficiencies during the project’s schedule. Skender’s subcontractor labor force to build the hotel will include local community hires from the surrounding West Loop neighborhood, as well as ample participation from minority-owned business enterprise (MBE) and women-owned business enterprise (WBE) firms. Skender has performed construction extensively throughout the Fulton Market District. At 1K Fulton, Skender teams have built spaces for Google, the SRAM headquarters and Swift & Sons. Across the neighborhood at 1330 W. Fulton (Fulton West), Skender has constructed the firm’s own headquarters and the headquarters for Sterling Bay, as well as spaces for The Climate Corporation and Glassdoor.